Although Earth Defense Force: Iron Rain is being marketed heavily for Western audiences, you can still find sprinkles of Japanese style throughout. Even still, this is the most Americanized version of EDF, and the development process had to change to appeal to those of us in the states. Because of this, Producer Nobuyuki Okajima wanted a developer that understood Western culture, which is why Yuke’s was tasked with the creation of Iron Rain. Yuke’s is a Japanese studio, but they make a lot of games for the Western audience and the creators understood my concept. For me, it’s very important that the studio can communicate [with] me in Japanese. Communication is super important when it comes to development, so it makes sense that Okajima would want a Japanese studio on the project. It also helps that Yuke’s knows what the Western market wants, so the fact that it is developing Iron Rain is not that strange. It is interesting playing an action game by a studio that almost exclusively makes wrestling games, though. Okajima was also asked about the Japanese market and how Iron Rain is expected to perform there. Specifically, we were wondering if there was a fear of alienating Japanese consumers, since the game has Western audiences in mind. Okajima stated that he does not worry about that. It may perform similarly to Monster Hunter: World, which also focused more on Western consumers. If that’s any indication, it could do well, since that game shipped almost 3 million copies in Japan alone. It will be interesting to see how Earth Defense Force: Iron Rain turns out, since it’s going through so many changes. Sure, it’s still EDF at its core, but it could find more of an audience here in the West, thanks to the work done by Yuke’s. 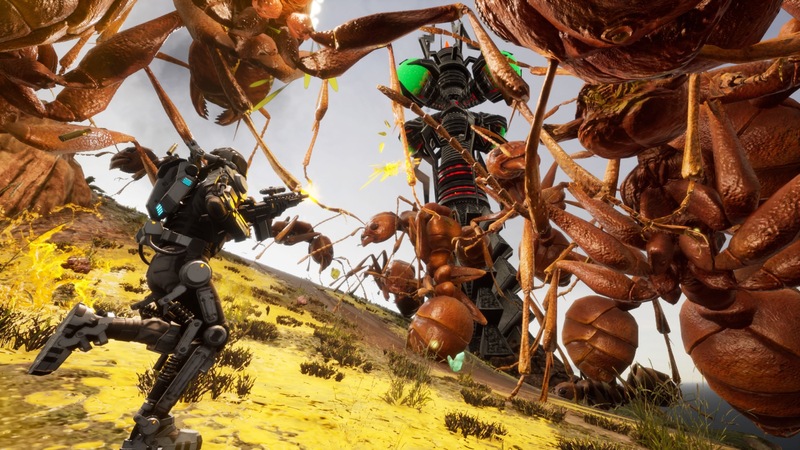 You can pick up a copy of Earth Defense Force: Iron Rain on April 11, 2019.